Local Food. Good People. Strong Community. Treat Dad to a BBQ at Alnoba! Get outside with the family this Father’s Day and celebrate Dad! We’ll have delicious BBQ and other sweet & savory snacks served from 1:00pm to 3:00pm. Bring your picnic blanket or chairs, load up the family and head on over to Alnoba. After you’ve filled up on food enjoy the beautiful outdoors: walk the many trails throughout the property, relax down by the brook, view the outdoor Art Park, and much more! 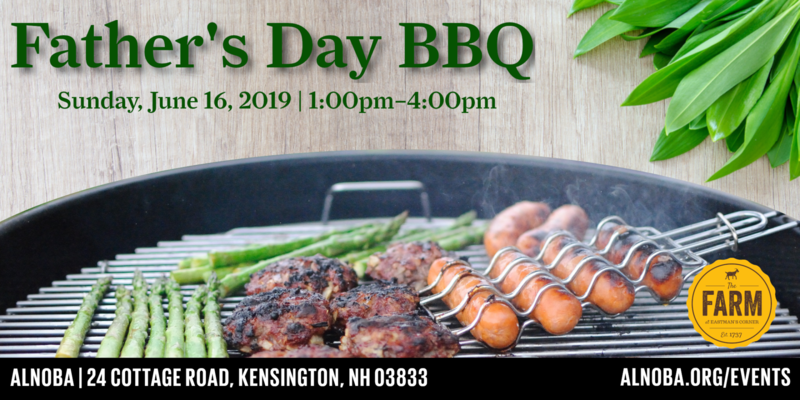 This will be a Father’s Day BBQ that you won’t want to miss! The Farm at Eastman’s Corner. All Rights Reserved.